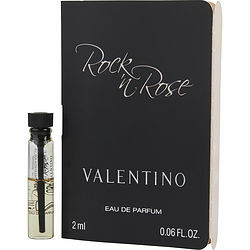 Wake up your senses with Valentino Rock 'N Rose perfume. Tangy orange blossom and sweet vanilla are infused with a lively kick of exotic crunch green, sandalwood and heliotrope. The light, unique fragrance was introduced by Valentino in 2006 and is the perfect complement to any casual occasion. The intriguing scent does not overpower, and the floral notes are pleasantly feminine. Spritz it on before work, a day of shopping or lunch with the girls and feel fresh and free all day long. What can I say? I am 81 yrs. and like to smell nice when I go out or after my bath and stay home. I put it behind my knees and on my wrists. It is not overpowering, but still smells of roses.